This experience takes Guests on a gentle ride high above Tomorrowland, and it makes for a great getaway from the hustle and bustle of the crowds at Magic Kingdom. Guests walk up a moving conveyor belt and board ride vehicles before embarking on a journey above Tomorrowland. 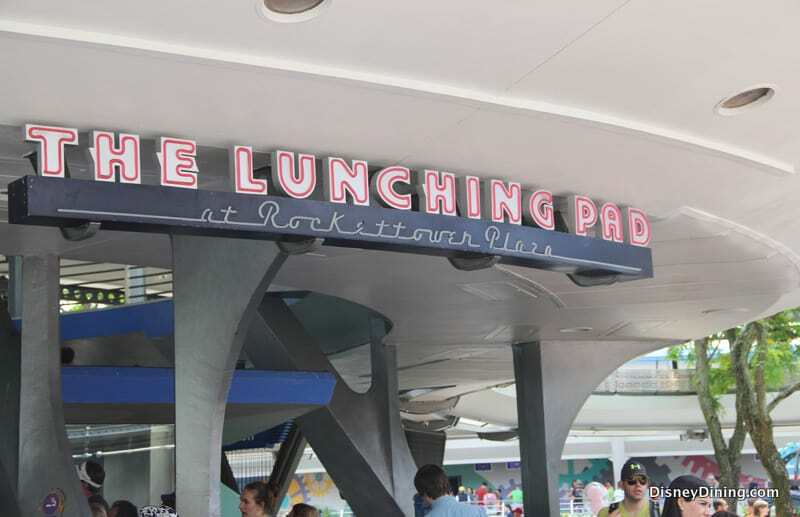 Once called the “WEDway PeopleMover” (for Walter Elias Disney), this 10-minute journey above the attractions, crowds and restaurants in Tomorrowland is very popular, even though there’s not usually a long wait. It’s not at all a thrill ride, but it’s still a must-do. 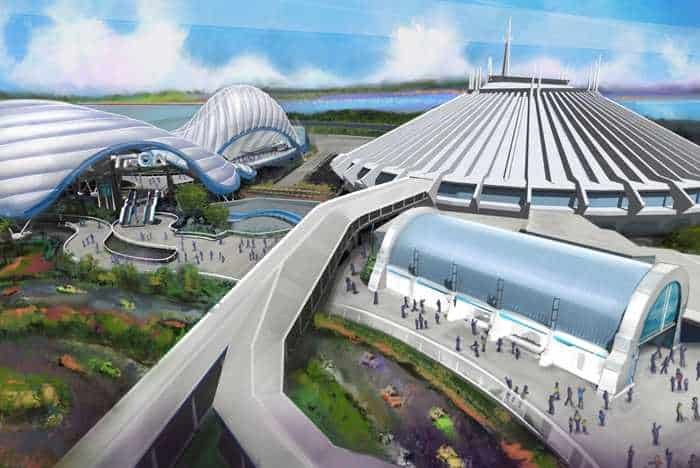 It gives Guests an interesting peek inside some of Tomorrowland’s best-loved attractions, like Space Mountain and Buzz Lightyear’s Space Ranger Spin. 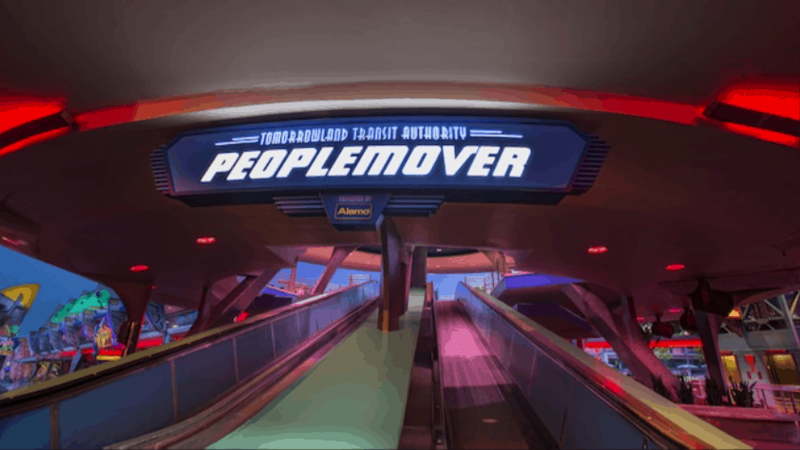 With its gentle breeze, the PeopleMover also serves as a refreshing timeout from the unrelenting Florida sun during the warmer months of the year. The Monsters Inc. Laugh Floor is a show that takes place under the premise of being the only comedy club in Monstropolis. Guests are seated in the 400-seat auditorium, and as the show begins, Guests of every age are invited to join in the fun of this interactive improvisational comedy show starring some of the monsters from Disney/PIXAR’s Monsters, Inc. The show is hosted by Mike Wazowski, and he is joined by other citizens of Monstropolis like Buddy Boil and Sam and Ella (the two-headed duo). Roz is even there, with her usual “perky” personality, casting doubt into Mike’s mind about whether he will be able to fill the canister with laughter. Because of the audience’s participation in each performance, no two shows are the same. Guests can even text their favorite jokes to the Comedy Club before the show begins. Their jokes may be read aloud during the show. Be ready for silliness, quirkiness, wisecracks, puns, knock-knock jokes and other forms of comical entertainment! The Purple Wall sits just to the right of the entrance to Tomorrowland, and it has a popularity that’s almost hard to believe! It was recently enhanced and given a broader color scheme (more hues of purple). 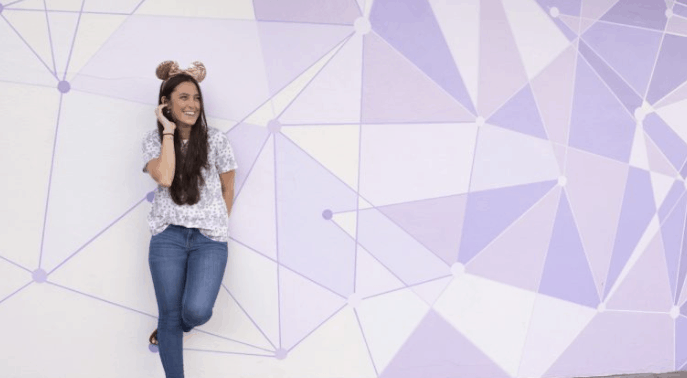 Instagrammers fell hard for the beloved Purple Wall, and it quickly earned its own very popular Twitter handle, #PurpleWall. Today people from all over the world are sure to snap a picture in front of the lavender wall when they visit Magic Kingdom. Space Mountain embodies a certain sense of a “retro future.” It’s a dark ride—in fact, completely dark—aboard a glow-in-the-dark rocket ship that blasts off for a journey through outer space. The ride only lasts about 3 minutes, but thanks to breathtaking views of comets, meteors, planets and stars, Guests feel as though they’ve had a tour of the cosmos. You’ll soar through the galaxy at a speed of 28 miles per hour and then slip into a wormhole as you prepare for re-entry! 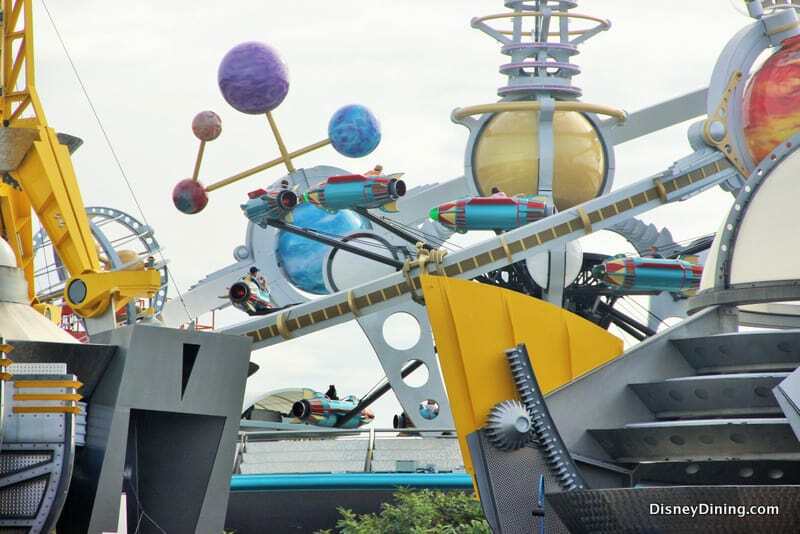 An elevator in Tomorrowland takes Guests way up above the space-themed land to a loading platform where they wait to board a 2-passenger spaceship. In this attraction, you have the job of the newest star pilot, and your mission is before you! Once you have clearance, board your rocket and prepare for liftoff! 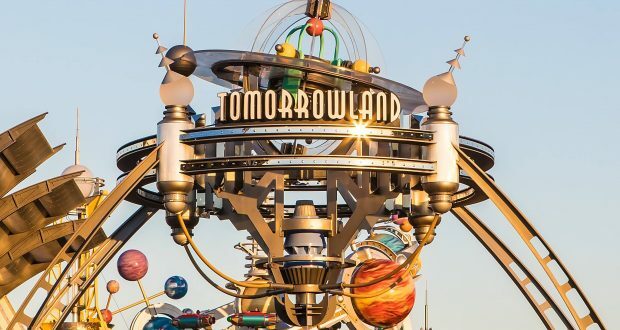 Enjoy a high-flying adventure around a galaxy of planets with all the sights and sounds of Tomorrowland beneath you. This attraction’s height and speed make it a more exhilarating experience than other spinning attractions like the Magic Carpets of Aladdin and Dumbo the Flying Elephant, even though it is similar in structure and features. Go ahead and get a FastPass+ time for this ride—especially if you’ve never been aboard before! At Buzz Lightyear’s Space Ranger Spin, you and a partner will board an XP-37 ship en route to infinity and beyond. You and your best bud are charged with battling the evil Emperor Zurg. See who has the best skill and aim! Use the on-board cannon to fire lasers at hundreds of targets marked with the letter “Z.” Every time you hit a target you earn points. Who will have the highest score? Beware—the evil Zurg is everywhere you look! This quick-service pick-up window is located just under the Tomorrowland Transit Authority PeopleMover. It serves snacks like chips, specialty pretzels and Mickey pretzels. The menu also includes a pulled pork sandwich, an all-beef hot dog, non-alcoholic beverages and churros. Looking for something different? Try the new Space Ranger Slush made with grape and sour apple-flavored slushes for a cool green and purple drink, reminiscent of Buzz Lightyear himself. Or order the Infinity pretzel. Be sure to wash it all down with a frozen Coke or frozen Fanta! Mickey’s Star Traders is a shop inside Tomorrowland that sells a myriad of souvenirs, gifts and more. The shop sells apparel and accessories, and it also has cameras, media, toys and housewares in stock. Be sure to stop by on your way to Buzz Lightyear’s Space Ranger Spin! This famous attraction has an elaborate backstory to it, and the best thing is that the story is true! It had its beginnings at the 1964 New York World’s Fair. It was designed by Walt Disney at the request of General Electric, and it was housed inside General Electric’s pavilion at the fair. It is presented as a stage show with several acts. Each act is performed on a different part of the stage that is partitioned off from the rest of the stage. The show takes place on a stationary stage, and at the end of an act, the audience seating area rotates around the stage, much like a carousel. The show makes use of animatronic human figures that move and “speak” with a recorded script. Each act highlights progress and its effects on man’s life and experiences over the years. Acts during the World’s Fair presentations were set in the 1880s, the 1920s, the 1940s and in 1964—the year of the New York World’s Fair. After the fair, the attraction moved to Disneyland where it opened in 1967. Then in 1973, the carousel moved to Disney World and opened to the public two years later. The attraction is a 21-minute stage production that has been through a few changes that include adding a new decade of change and removing another, but the theme is still progress. Don’t miss this one, and remember, there’s always a great big beautiful tomorrow, shining at the end of every day! 1. TRON Lightcycle Power Run – COMING SOON! This exciting new semi-enclosed launched steel roller coaster is under construction now and will be open and operating in time for Disney World’s 50th anniversary in 2021. This fascinating and futuristic ride will take Guests on a journey reaching speeds of more than 60 miles per hour. The same attraction opened at Shanghai Disneyland on June 16, 2016, and we can’t wait for it to open in Tomorrowland at Magic Kingdom.